You're just like us, we take up most of the bed too… hey, they're lucky we let them share it with us. As for the kitties, well you're a better schnauzer than us. Congrats on your Award! Way to Go! Hey there Oskar – Congra-chu-la-shuns on your award – it iz very pretty. An'thank u so much for choozing us tu be one tu share it with – that iz such an honor. 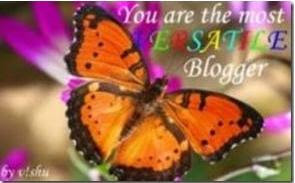 We will b shure tu check out Erin's blog tu. Oh – an'that iz how u an'us r dif-rent cuz we don't git along with catz, well at least Shiloh don't fer shure. Oh Tank youz Oskar for my most wunderful award! I just luvs learning new things 'bouts my furiends too. I can'ts beleeve youz take dat heartworm stuff withouts anything on it…I needs peanut butters on mine! We love hearing things about you….a bit worried about the cat thing. Congrats on your award. Congrats on your well deserved award, my friend! I love to learn more about my friends! And thank you for giving me the award….you are too kind. Oh furry thanks – Rudy is very happy! Furry thanks! And congrats to you! your factoids are pretty nifty. i totally wish my mama and daddy would let me sleep with them in the big bed, but noooo, i'm not allowed. they say i wake up way early in the morning and try to harass my big sis asa to play. boohoo. Congratulations on your Award, Oskar! That "bed situation" sounds very familiar to me! Your blog caught our eye as soon as we read "Everybody needs a little schnauzer in their day!" So cute & so true! Oskar's blog is well deserving of this award. Sometimes I don't bring the ball back if I'm playing with Oscar incase he gets it next time! Congratulations on your award, Oskar! We eat our heartworm tab like it's a treat too! Good morning Oskar! OMD! You ARE excessively handsome (wink-wink)!!!! Congrats on your beautiful award! We received one from Miley which we are proudly displaying too! I'm looking forward to being furiends and reading you daily blogs! Oh, yes, Oskar! You are Most Definitely excessively handsome! Like you said, I already knew that but it never hurts to be reminded. Congratulations on your awardie and thank you, thank you for passing it along to me! I'm glad I discovered your bloggie and we got to be furends! Hmmm, we have to sleep downstairs at tnight and wer're not allowed into the humans bedroom. We're beginning to feel a bit cheated!! We're not surprised that orange octopus is your favouite toy, we've coveted it since we saw it! And we won't let on about the kitteh's, he he he! Congrats on such a pawsome award – we're gonna swing on by and see Erin right now!